Nashville might be known as “Music City,” but there’s far more to this booming metropolitan area than country music record labels. With a strong culinary culture, several museums and historic landmarks and a plethora of kid-friendly attractions in the area, Nashville is a great choice for your next family vacation destination. Among the classic tourist stops like the Ryman Auditorium and the Opryland Hotel are these ten great attractions, which are sure to strike a pleasing note with every member of the family. 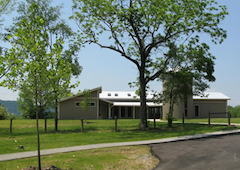 Bells Bend Outdoor Center (Nashville, TN 37218) – Part of the Bells Bend Park complex, the Bells Bend Outdoor Center offers a variety of activities for families, children and adults. There are also plenty of resources available during times when no events are planned, including books, found items and nature-themed toys. Belle Meade Plantation (Nashville, TN 37205) – Situated on a thirty-acre historic site, the Belle Meade Plantation was originally built in 1853 and now serves as a museum. There’s a Plantation Station Toddlers program held on Wednesdays at ten and eleven o’clock in the morning, which includes arts and crafts activities and story time. Owl’s Hill Nature Sanctuary (Brentwood, TN 37027) – Just over the county line in Williamson County, Owl’s Hill Nature Sanctuary is a one-hundred and sixty-acre complex dedicated to species protection, research, conservation and education of the community. Seasonal activities take place throughout the year, so be sure to check out the event calendar in the weeks leading up to your visit. General Jackson (Nashville, TN 37214) – While the main cruises on the General Jackson leave at six-thirty and don’t return until after ten o’clock at night, there are afternoon offerings for the general public and specialty morning cruises for children on Saturdays from June through August. Meander down the Cumberland River while experiencing a little slice of the Music City, with live music and meal options available for all three tours. The Parthenon (Nashville, TN 37201) – Nestled in the center of the beautifully-landscaped Centennial Park is a bit of Grecian history, right in Nashville. A replica of the original temple to Athena in Athens, Greece, there’s also an art museum inside the Parthenon. There are a variety of seasonal events and activities taking place in the Parthenon and surrounding park throughout the year, so don’t forget to check out upcoming events before you plan your outing. Cannonsburgh Pioneer Village (Murfreesboro, TN 37130) – Recreating the living conditions in the century that stretched between 1830 and 1930, Cannonsburgh Pioneer Village features a school house, museum, Wedding Chapel, doctor’s office, grist mill and blacksmith shop. If you’re interested in regional oddities, the site is also home to the world’s largest cedar bucket. Exploring the village is free of charge, but a small fee is collected if you’d like to take a guided tour. Cheekwood Botanical Garden (Nashville, TN 37205) – Botanical gardens covering fifty-five acres with a thirty thousand square foot museum make up Cheekwood, a favorite destination for local families and tourists alike. Year-round activities for children are in place, including arts and crafts on Tuesdays and Saturdays and a Summer Art Camp for kids from ages two to twelve. If you’d prefer a guided tour, be sure to call at least two weeks in advance to make arrangements with Cheekwood staff. Adventure Science Center (Nashville, TN 37203) – While the Adventure Science Center’s primary goal is making science fun and exciting for kids, there’s also plenty to keep adults entertained and learning, as well. Health, physics, technology and environmental science are all subjects touched upon in the permanent exhibits, with a surprising number of seasonal and touring exhibits setting up shop within the museum throughout the year. Nashville Zoo at Grassmere (Nashville, TN 37211) – Nashville Zoo is situated on the Grassmere Historic Farm, which is listed on the National Register of Historic Homes. While there are a full complement of animals spread over the beautiful Zoo grounds, you definitely don’t want to miss an interpreter-guided tour of the historic home and grounds. Don’t miss the Wilderness Express Train, which takes riders through areas of the Zoo that you wouldn’t ordinarily be seen by visitors. Brentwood Children’s Library (Brentwood, TN 37027) – Chosen by Livability.com as one of the top ten children’s libraries in the country, the Brentwood Children’s Library truly is an enchanting spot for kids to relax with a good book or catch story time. There are several programs in place for kids of all ages, in a beautiful setting just outside the downtown sprawl of Nashville. While you’ll naturally want to explore the stretch of Lower Broadway that plays host to such legendary hotspots as Tootsie’s Orchid Lounge and the Country Music Hall of Fame, it’s best to schedule that part of your visit for the early morning to late afternoon hours. When the sun goes down, the culture and atmosphere of Lower Broadway becomes decidedly more grown-up, with plenty of adult beverages flowing at the iconic honky-tonks that line both sides of the street for several blocks.